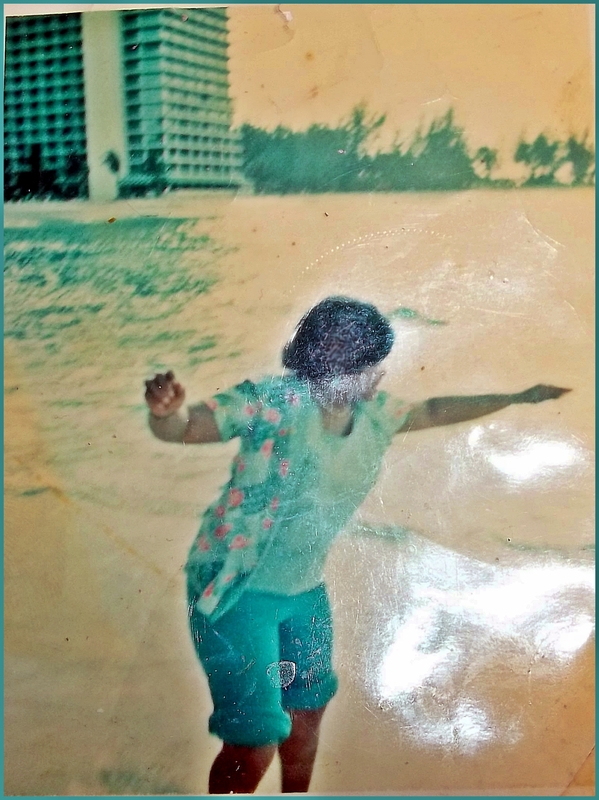 This old smudged picture is of my mom on my parent’s honeymoon in the summer of [date redacted] to the Bahamas. My sister and I always called this picture “Bahamas Mama” although our mom was quick to remind us that she wasn’t either of our “mama” back then and since she became our “mama,” she has never been able to fit back into those hot pants. We had no idea what she’s pointing to, and she didn’t remember, so we made a game of it. Maybe it was the Loch Ness monster? No, the water was too warm for that. Maybe it was Godzilla? Could he really have gotten there from Japan? My favorite suggestion (since I was five at the time) was that maybe she was pointing at The Little Mermaid. Yep, it was the little mermaid, because that crab (or was he a lobster?) definitely had a Caribbean accent.